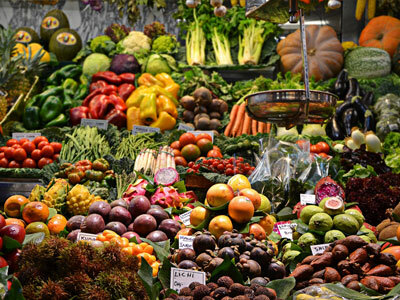 We already know fruits and veggies are extremely important to our health. They’re a source of nutrition, providing potassium, vitamin A, and more. But they have a lesser-known benefit, too: They can also help defend us against wrinkles and age spots! Karen Asp, author of ANTI-AGING HACKS, shares 7 ideas for how to boost your fruit and veggie intake for the new year to get healthier, younger-looking skin. You really are what you eat, and by eating more fruit and veggies, you can fight wrinkles and get glowing skin. It’s recommended that Americans eat 1.5 to 2 cups of fruits and 2 to 3 cups of veggies every day, but only 12 percent are eating enough fruit while only 9.3 percent are eating enough veggies. Fruits and veggies don’t just feed your body. They also nourish your skin, as they’re filled with powerful antioxidants that protect your skin from sun damage, age spots, and wrinkles. They’ll also aid skin growth and give your skin a healthy glow. Besides skin health, not getting enough fruits and veggies has other impacts on aging. Studies show that people who eat fewer than five servings of fruits and veggies a day had shorter telomeres than their produce-loving peers. The reason? Antioxidants in fruits and veggies stomp out free radicals, molecules that can damage cells and encourage telomeres to shrink more rapidly. Get more tips on self-care in ANTI-AGING HACKS by Karen Asp! Excerpted from Anti-Aging Hacks by Karen Asp. Copyright © 2019 by the author. Used by permission of the publisher. All rights reserved. Photo by Ja Ma on Unsplash. Preserve your looks and your health with these 200+ easy strategies to age-proof your body and mind. Are signs of aging—or even just worrying about signs of aging—taking their toll on you? 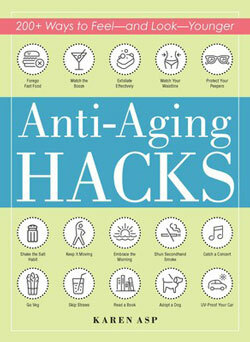 In Anti-Aging Hacks, you’ll find more than 200 easy, actionable tips and exercises you can implement right away to help age-proof your body and mind. Through straightforward, easy-to-understand language, you’ll learn how to preserve your appearance and health, as well as combat —or prevent—the most common ailments, conditions, and risks associated with aging. From protecting your skin from wrinkles and fortifying your diet, to strengthening your body with fun and easy exercises and staying mentally sharp with stimulating activities, to preserving a youthful glow, you’ll find all you need to know to stay healthy, strong, sharp, and youthful for years to come. 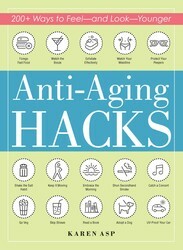 A selection of anti-aging hacks include: -Sleeping on your back to reduce wrinkles -Wearing sunglasses to help prevent cataracts and macular degeneration -Slowing aging and improve health through intermittent fasting -Using skincare products with retinol -Reading for 30 minutes a day to increase your life span Embrace Anti-Aging Hacks as your own personal fountain of youth—in handy guidebook form!